GestureTek licenses a vast and robust library of video gesture control technologies, applications and game engines – developed, patented and optimized over a solid 20-year history. Our flexible technologies are designed to support any environment and to allow content to be easily ported between devices and platforms. Any camera-enabled device or display surface can be vision-equipped with GestureTek’s patented gesture-recognition technology, including PCs, consoles, set-top boxes, mobile devices, toys, games and other consumer products. The technology can also be integrated into appliances and peripheral devices like wands or joysticks - delivering a gesture control interface that can be tracked in complete 3-D space, with no need for embedded electronics. GestureTek’s patents, technologies and game engines can be licensed to provide toy companies, game and application developers, original equipment manufacturers and consumer products companies with everything required to integrate computer vision control into their products. API’s include full-body analysis and motion tracking, as well as feature-specific tracking such as face, hand, color and object tracking. Whether the solution requires single-camera or multiple-camera technologies, 2D or 3D vision, or ‘static’ or ‘moving’ control, GestureTek has multiple applications and full toolkits in various configurations available for over-the-air download. GestureTek also provides consulting, hardware design and software development services to help organizations get the most out of their licensing agreement. Three key patents protect the camera-enabled gesture-recognition technology invented by GestureTek. The first patent (applied for in 1990 and received in 1996) set the industry standard for computer vision control. Current U.S. patents include 5,534,917 (video image based control system), 7,058,204 (multiple camera control system) and 7,227,526 (3D-vision image control system). Multiple international patents have also been allowed and a further 37 patent applications are in various stages of the patent process. Working to deliver gesture controlled set-top box technology to multiple manufacturers and broadcast providers. 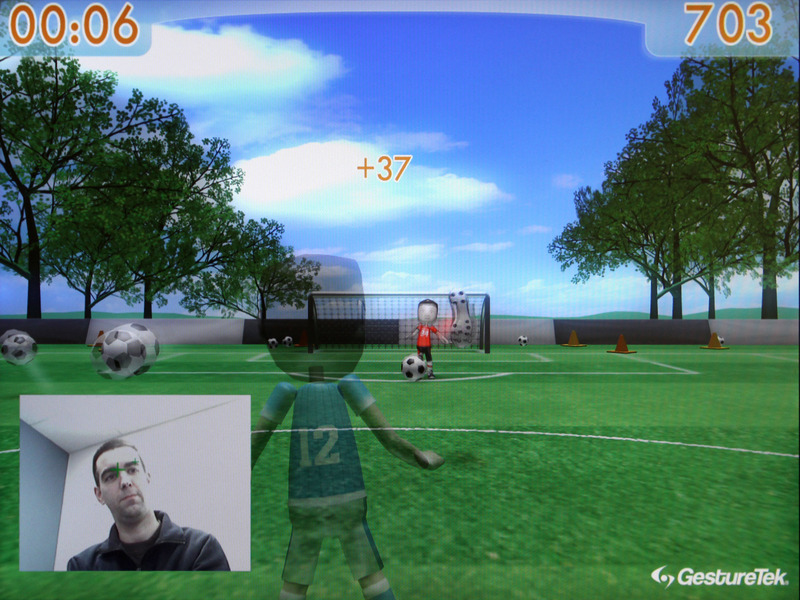 Gesture-enabled games featured on Mobile Internet Devices based on Intel Low Power Chip Technology. Launched licensing for hand-held game stick prototype, for Wii-like control without the need for embedded electronics.